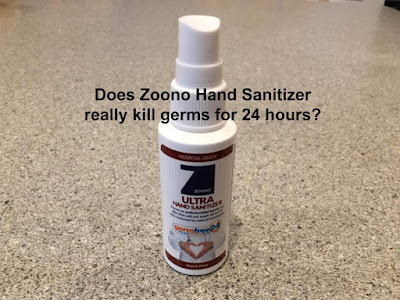 Zoono Ultra GermFree24 Hand Sanitizer is a very exciting product because it claims to kill norovirus AND continue to work for 24 hours. Of course, I couldn't resist testing it. I purchased Zoono Ultra on Amazon. If you don't want to read this entire page, click here for the short "spoiler" results summary. Before I could determine how well Zoono works for 24 hours, I needed to determine how well it kills germs immediately after using it. For these experiments, I used my children's hands. Their hands were not visibly dirty, but they had been at school and had pet our dog. First they rubbed their dirty hands onto agar plates. Then I put 10 sprays of Zoono Ultra on their left hands, and I rubbed it in. That amount of spray is about 1/4 teaspoon. I let the sanitizer sit on their hand for 1 minute, and then they rubbed that Zoono hand all over another agar plate. Then I put a nickel sized amount of Zylast antiseptic (about 1/4 teaspoon) on their right hand and rubbed it in. I let the Zylast sit on their hands for 1 minute and then rubbed that Zylast hand onto another agar plate. I incubated the plates in my warm 90 degree F incubator for 48 hours. As you can see, 10 sprays of the Zoono Ultra does kill a lot of germs. It doesn't seem to do quite as well as Zylast antiseptic in my experiments, though, but it does kill germs. Just in case touching the agar left a residue on the hands that made it difficult for Zoono to work, I did another test where my son rubbed his right hand only on the agar plate for the dirty control. I sprayed his left hand with 10 sprays of Zoono, rubbed it in, and let it dry for 1 minute. Then he rubbed the left hand onto another agar plate. The Zoono does seem to work better on the hand that did not first touch the agar. So, I do think Zoono does a good job killing germs on relatively clean hands when you use 10 sprays. I have not tested Zoono on dirty looking hands yet. How well does Zoono and Zylast do after rinsing? I know that most people who use hand sanitizer don't have access to a sink to wash their hands. So, you aren't going to normally rinse your hands after using hand sanitizer. However, in this experiment, I decided to test Zoono and Zylast after I rinsed it off. I did this because I wanted to determine how much the hand sanitizers kills in one minute. I didn't want residual hand sanitizer incubating on the plates with the bacteria. So, first the kids rubbed their dirty hands on the plates. Then, just like in the previous experiments, I put the hand sanitizer on the kids' hands, rubbed it in, and let it sit for 1 minute. Then I rinsed their hands briefly under tap water. It was a super quick 4 second rinse. Then the kids rubbed their hands all over another agar plate. As you can see, the Zoono did not do well after the 4 second rinse. It is possible that the Zoono needed more time to kill the germs. The Zylast still did very well so that means it EITHER killed a lot in one minute OR didn't rinse off during the quick rinse (or both). I frequently do negative controls where I swab my tap water and rub the swab on the agar plate so I know that the germs are not coming from my tap water. Does Zoono keep working for 24 hours? Zoono is advertised to continue killing germs for 24 hours after you apply it. I did not test it for a 24 hours. I wanted to see if it still appeared to be working after just 1 hour. In this experiment, my children washed and dried their hands. Then I sprayed one hand with 10 sprays of Zoono and rubbed it in. They held that hand still in the air for 1 minute to let the Zoono dry. I did not put anything on the other hand. Then they all went to martial arts class where there was lots of touching and high-fiving. When they got home about 1 hour and 15 minutes later, they held their hands up in the air for 1 minute to give any recently touched germs a chance to die, and then rubbed their hands onto agar plates. The plates were incubated for 48 hours. As you can see, both the hand with the Zoono and the hand with no sanitizer still had plenty of germs on them after only 1 hour and 15 minutes. I can't see any extended germ-killing activity from the Zoono. However, I have never been able to show that Zylast or any other hand sanitizer continues to work after being applied. So, I am not saying that Zoono doesn't kill germs for 24 hours like the company claims. I'm just saying that I have been unable to show the continued activity, and there are still plenty of live germs on people's hands shortly after using Zoono (or any hand sanitizer that I have tested). Perhaps there is some residual germ-killing continuing for hours after the sanitizer is applied, but with new germs always being added, it is difficult to see the continued germ-killing in these experiments. If you would like to order Zylast antiseptic, it is available on the Zylast website www.zylastdirect.com. If you use coupon code StopNorovirus you will get 10% off your order. If you would like to order Zoono, it is available here on Amazon . If you would like to see my list of hand sanitizers that I recommend for killing stomach viruses, please read this page of my Stop the Stomach Flu website. If you would like to support my work, please use any of my amazon links to shop on Amazon, and I'll get a small percentage of the sale. That is the money I use to do these experiments. Thank you. --Annie Pryor, Phd.